According to Jeffrey's book(Windows via C/C++) , When using CRT function/library(_fcvt, errno, atof, etc) in thread procedure, we should use _beginthread/_beginthreadex. Because, _beginthread/_beginthreadex allocate memory area for CRT . However CreateThread does not has any method for CRT. So It makes an unpredicted quit and memory leaks. I've tested CreateThread and _beginthread/_beginthreadex. Below code is tested code. Project was Consol Project and used Purify Plus for detect memory leaks. Result is CreateThread occured memory leaks. This capture shows memory leaks at using _fcvt CRT function. Below capture shows no memory leaks when using _beginthreadex. 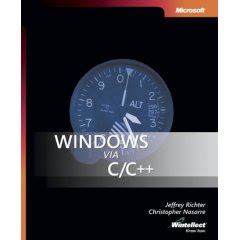 The Greatest book of the this century was published for Visual C++ programmers. Finally I got the book. I'm really look forward Jeffrey's new book. I didn't read yet, however hitted my heart big impact just looked appearance. A beta version of a major MFC/TR1 feature pack is now available for download. Please note that this feature pack is only supported on systems which have the English language (ENU) version of Visual Studio Team System 2008 Team Suite or Visual Studio 2008 Professional Edition installed. Please note that the beta installation may require Visual Studio 2008 media be available during setup. This will be resolved in the final release. Copied from VC++ Team Blog.